Whenever someone tells me that there’s no money in merchandise, I want to scream. Merchandise programs can become your league’s greatest return on investment. Especially once your merchandise program is established. This is the first of a three-part series on derby merchandise programs and the best use of your merch committee’s time. Although this series is specific to roller derby, the following applies to bands, performers and anyone else who might sell merchandise at their events. -Bands make their name on the road. Most will tell you it is merchandise sales, not a cut of the door sales that support their ramen-noodle habit and van. -My son loved watching the monster truck TV series, “Monster Jam.” One episode, Dennis Anderson, owner of the iconic Grave Digger, made a prolific statement about merchandise sales. In his early years, he ran the truck until it was wrecked, “to get the most out of merchandise sales.” That’s right, he traveled the country destroying expensive trucks to boost merch sales. Roller derby merch has the same potential. Though there are many types of merchandise you can sell, clothing will draw your greatest sales and profit. T-shirts are critical to any merch program. They are relatively inexpensive to make and can generate a strong profit. Your relationship with your clothing producer is a critical one that’s reliant on trust, so be choosy when it comes to your vendor. The three factors to be aware of when choosing a vendor are reliability, the cost goods and the quality of their work. Too often, leagues have “merch problems” from making a poor choice of vendors. Many leagues are offered great deals from startup print shops, a league-mate’s friend or even someone within the league. You get a great deal. At first, your orders may not have time sensitivity. Especially if it’s off-season or the league is in early stages. But when you need inventory by a certain date and it doesn’t show up, it’s a big problem. Ask to tour their shop prior to committing your business. If they keep stalling, they don’t have a shop. They have limited equipment (potentially homemade) in a corner of a basement or garage. One or two screen presses won’t keep you stocked, especially once there are other customers. If they made their own screen printers (fairly easy), the turnaround time on each piece will be a killer. If a tour of the shop shows you professional equipment for creating screens, printing bulk shirts, advanced drying equipment, heat presses, CAD cutters (printers that cut a vinyl material) and the like, you’re working with professionals. Don’t be afraid to look into larger companies. When I had my own t-shirt company, all of my screen-printing was done by a large facility contracted by the likes of Nike and Reebok. Yes, my orders were squeezed between large corporate ones, but done with consistent quality, available as promised and often less expensive than if done in smaller shops. Remember, league money needs to be held tight. Spend it cautiously, especially early on and know that every dollar spent needs to earn more dollars. Choosing the right shirt printer is a vital first step. There are two ways to maximize the contributions of your merch program—find the right selling price and keep costs low. Your goal is to make quality merch at the lowest price possible. Clothing printers will provide you with shirts and do the printing. They buy the t-shirts at wholesale prices and mark the price up. If you’re told blank t-shirts are $4, work on driving that price down. Let me arm you with reality. A quality, men’s black tee, at wholesale price, is no more than $2.50. It’s also not uncommon for wholesalers to run specials for under $2. My goal was to create a final product for $6 maximum and sell at $15, which is an acceptable price for fans. As my own company however, I bought shirts at wholesale and either applied the print myself or sent them to my screen printer to use. Some printers will not allow this, some will–they have to make money too. But if your single-color tees are running $8 to make, force them to bargain or walk away. You hold the cards in this decision, don’t let them pressure you into a cost that is too high. T-shirts don’t have to be anything special, but they should be quality. Gildan is just one example, but a very popular choice for good reason. 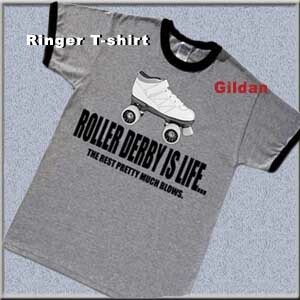 Gildan is popular because it’s a reasonable for the quality, they make a sturdy 5.1 oz. cotton tee and provide them in men’s, women’s and children sizes. When choosing a t-shirt vendor, ask for a sample. Put your hand inside the shirt. If you can see your hand clearly through the cotton, don’t use them. It indicates poor quality. The shirt will shrink drastically and the print will chip in a short period of time. As you will learn, start easy with safe bets on merch and slowly build as the demand rises. Begin with t-shirts only; one or two styles with a decent stock of sizes. Upcoming blog posts will explain building an inventory plan, projecting merch needs and the kinds of merchandise that are risky or not worth the return. What do you think? Comment below with your merchandise experiences or questions. Tags: business, derby, Event Tips, marketing.